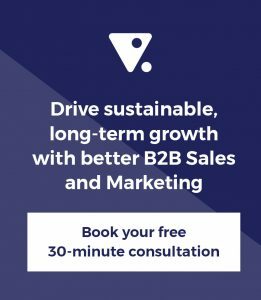 What’s the best way to build a Sales and Marketing Plan? I’ve pulled up five articles to help answer that question. Whilst none of them actually got it right individually, collectively they did a great job. Your path to building a Sales and Marketing plan has eight steps. Do your homework before planning. Include research, market and competitor analysis, extract sales objectives from revenue targets). Agree the problem you are trying to solve, who most has that problem, and how you can best solve it. Let me show you the five articles which bring some colour to these eight steps. Mindful that the topic here is Sales and Marketing Plan, I was delighted the first article that came up on Google results was an article about alignment. Rather than simply assuming that Sales and Marketing got their act together, it explicitly argues how to. More still, I was really excited that the author had sought explicit agreement as to how to move buyers through the buyers’ journey. That’s a term I coined in 2003 to describe how you move buyers from one stage to the next. I agree that you want to get both to agree to the strategy and the tactics, that is, Sales and Marketing need to agree to both. Frankly, all up, a great job. Second article is from The Whole Brain Group. What a big title – “Tips for Developing a 2015 Sales and Marketing Strategy”. Now, Google seems to be comfortable interchanging strategy and planning because the topic we searched for is Sales and Marketing Plan. Google’s happy that they’re similar, I don’t think so. The authors didn’t get confused about that, their topic is strategy and they’ve spoken of strategy, not of plan. But for all that, it’s nothing really great, it’s a list of 101 topics that you need to cover in the strategy so don’t bother. The links will be in the show notes but it’s not my favourite. Business Plans and Marketing strategy, by Business Balls. This article did my head in, only because of its depth. There’s a lot of work that they put into this. It’s deep and it’s thorough, and it’s good if you want a lot of theory. Now, I’m going to sound a little unkind here because I think they have done a good job. Frankly, if you want a practical “How to Build a Sales and Marketing Plan”, this isn’t it. Firstly, it is about business planning, more than about marketing. The inclusion of marketing plan seems to be somewhat arbitrary. If you’re trying to work out how you’re actually going to act on the business plan then why only include marketing strategy? What about your capital strategy, your human strategy, your asset strategy, your IT strategy, your finance strategy? They’re all important.It seems a bit of an arbitrary link and, frankly, not one that’s been properly planned. For all of its depth and cleverness, not one I’m going to recommend unless you really want some great tools, backgrounds, and templates on Business Planning – it most certainly does that. Now, A Sales Marketing Plan in Four Steps, fantastic. Great title, it’s exactly what I’m looking for but it’s so 101. Really, no long depth here, nothing much to talk about. As usual, I’ll give you my spin on this but first I want to honour what those five contributors are saying. If you enjoyed that then likely you’ll enjoy other shows, we do one every week. If you haven’t already, then can I invite you to subscribe at either align.me/blog or Youtube.com/alignmeb2b. Clearly, we were building a case for how to build a Sales and Marketing Plan today. Therefore, take a look at Funnel Plan and see if that can help you to build your Sales and Marketing Plan. Now, a free version should be enough for most businesses. It’s got great videos that can help you understand how to build a Sales and Marketing Plan. If you want a little more detail there are paid versions you can entertain after you’ve built your first basic plan with the free one. Take a look now at funnelplan.com.